A professional sealing service ensures that you won’t have troubles with mildew and fungus in the future. The expert handymen know exactly how to apply sealants to ensure they will serve their purpose. And the job will be done cleanly and efficiently, without disrupting your daily routines too much. Your mastic man can work with any type of sealants and adhesives including silicone, mastic, plastic and other. The experts of Fantastic Handyman are here and they mean business. Every sealing task, be it for your kitchen, bathroom, or any other area of your home, will be handled with great, efficiency, without a mess left behind for you to deal with. Moreover, if there's some tiling or grouting work to be done you can be absolutely sure, that the handymen will take care of it. 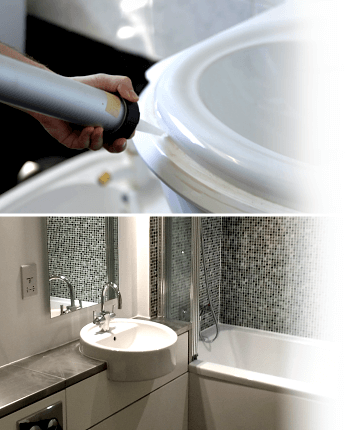 Everything necessary for the timely completion of your service will be brought by the specialists so that your bathroom/shower/sink will be sealed perfectly. This includes the materials that will be used. Also, did you know there are sealants of various colours? You can tell us which one you prefer in advance and your handyman will bring it. And please keep in mind that the costs for the materials used will be added to the final bill. Our professional sealing is available to London areas within the M25 in London & Manchester area.